Illinois Compass 2g has a new profile feature that allows users to customize the presentation of their online, in-course identity. A user can upload their choice of pictures and include scholastic information such as major and interests. The creation of a profile is voluntary, but it can offer a simple way for instructors to get to know students in the class, as well as students to get to know fellow classmates. Hidden: No one can find and view the user on the People page. The user's name and avatar appear throughout their courses, but others can't view a preview of the profile from there. My Institution: Anyone at the user's institution can find and view them on the People page. Others do not have to be enrolled in the same course or organization as the user. The user's name and avatar appear throughout their courses, and others can view a preview of their profile from there. If a user feels uncomfortable with someone seeing their profile or interacting with them, they can select Block on that user's profile or profile card. When a user selects this option, a confirmation message appears. When a user blocks another user, this is a personal action between two users and requires no action on the part of the administrator. The profile is deleted, including all of the profile information, the profile card, the Avatar photo, the profile wall, any posts the user made to the profile wall, and any comments other users made on posts. The People tool is no longer available. The user will no longer be able to access the People tool, view other users' full profiles (although profile cards will still be viewable), nor will their profile be discoverable, as it will no longer exist. Any comments they made on other user's Profile Walls will appear as Deleted User. The Messages tool is no longer available. The user will no longer be able to access the Messages tool or send cloud messages. Course Messages and email will still function normally. Their contribution to any Messages conversations will appear as Deleted User. The Spaces tool is no longer available. The user will no longer be able to access Spaces at all. Any previous contributions to Spaces will appear as Deleted User. The user will appear anonymously in Blackboard Open Content. 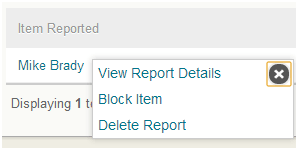 Any contributions to Blackboard Open Content Forums or submission to Blackboard Open Content Assignments/Tests will appear as Deleted User in the Blackboard Open Content interface. Although the user appears anonymously in the Blackboard Open Content interface, the numeric Blackboard Open Content ID persists and is still mapped on the Learn side to the Learn user ID, so the submissions to Blackboard Open Content Assignments and Tests still appear attributed to the correct user in Learn. However, that data won't be present in any Blackboard Open Content interface. Profile deletion process is irreversible. The user can create a new profile, but it won't re-attach to any of the data (for example, posts made to Spaces under their original profile).